The global MRI guided neuro ablation devices market is predicted to grow at 5.3% CAGR during the forecast period with the market size reaching USD 175.6 million by 2024. Different products such as MRI guided RF ablation system, MRI guided focused ultrasound systems, and MRI guided laser therapy system are majorly contributing to the MRI guided neuro ablation devices market size. The market has witnessed significant demand for MRI guided RF ablation system over the last few years due to mounting awareness of minimally invasive surgery. MRI guided neuro ablation is a minimally invasive neurosurgical technique used for various diseases including a brain tumor. These devices use MRI guided high-intensity laser probe for the ablation of brain cancer cells. The device is designed for the treatment of majorly brain tumors. The probe used in the system destroys the target cancer cell leaving its neighbor cells unharmed. It is mainly performed thalamus, insula, and basal ganglia of the brain. Based on product, the MRI guided neuro ablation devices market is categorized into MRI guided RF ablation system, MRI guided focused ultrasound systems, MRI guided laser therapy system, and accessories, of which MRI guided RF ablation system has significant demand in the MRI guided neuro ablation devices market, globally. The usage of the system excludes the requirement of an incision, which is essential during the surgical procedure led to the fastest growth of the MRI guided focused ultrasound systems segment during the historical period, which is also predicted to continue during the forecast period. On the basis of the end user, the market is segmented into hospitals, ambulatory surgical centers (ASCs) and others. Of all, the MRI guided neuro ablation devices market size for ASCs is expected to grow at the fastest rate during the forecast period, globally. In addition, of all end users, hospitals accounted for the largest share of the market, owing to the elevated inclination of the patient to visit hospitals for the management of brain cancer. 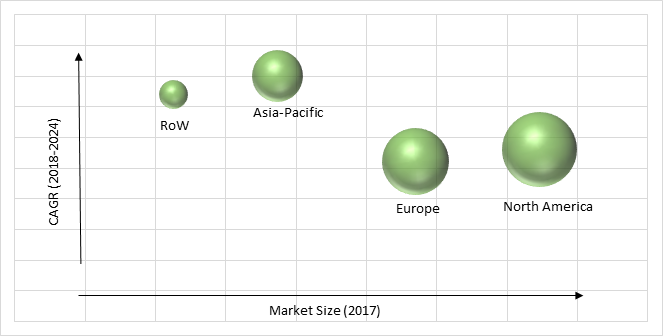 The mounting number of neurosurgery, technological advancement, growing geriatric population, the mounting occurrence of cancer, mounting government funding and initiatives, and escalating awareness of minimally invasive surgery are the key factors leading to the growth in the MRI guided neuro ablation devices market, globally. For instance, according to GLOBOCAN globally, approximately 14.1 million new cancer cases were diagnosed and there were 8.2 million cancer deaths in 2012. In addition, according to the World Health Organization (WHO), in 2015 approximately 8.8 million people died due to cancer. Moreover, according to GLOBOCAN, in 2018 approximately 296,851 people are suffering from brain and nervous system cancer, and are expected to reach 309,040 by 2020 and 435,554 by 2040. Owing to the mounting occurrence of brain tumors and cancers has resulted in increased adoption of minimally invasive surgery for the management of the condition. Moreover, escalating healthcare is further increasing the affordability of the patient for the treatment. Some of the other key factors driving the growth of the industry are technological advancement, changing lifestyle, and escalating healthcare expenditure. Key factors hindering the growth of the MRI guided neuro ablation devices market are limited awareness among patient about the treatment brain tumor in developing countries, high cost, and a limited workforce. In addition, the dearth of skilled professionals is also having a negative impact on the growth of the market. Geographically, North America is the largest MRI guided neuro ablation devices market as the region geriatric population is increasing and favorable reimbursements policies. In addition, the mounting occurrence of cancer, escalating healthcare expenditure, changing lifestyle, and escalating awareness of minimally invasive surgery are also fueling the growth of the North American MRI guided neuro ablation devices market. For instance, according to GLOBOCAN in the U.S., approximately 1.6 million new cancer cases were diagnosed and there were 0.6 million cancer deaths in 2012. Asia-Pacific is observed to witness significant growth in the MRI guided neuro ablation devices market during the forecast period, as the region comprises of a large population and expanding the geriatric population. Moreover, mounting occurrence cancer, refining healthcare infrastructure, mounting awareness of minimally invasive surgery, and escalating healthcare expenditure are also facilitating the significant growth of Asia-Pacific MRI guided neuro ablation devices industry. Market players in the MRI guided neuro ablation devices industry are investing capital to develop technologically advanced systems. In April 2018, Medtronic Plc launched the Visualase, an MRI-guided laser ablation system in Europe. The system offers advanced MRI-guided laser ablation technology which is used in neurosurgery procedures. Medtronic Plc, Insightec Ltd, Monteris Medical Inc, Boston Scientific Corporation, AngioDynamics Inc, and MRI Intervention Inc. are some of the key players offering solutions for MRI guided neuro ablation devices. Table 119 Snapshot – MRI Intervention Inc.